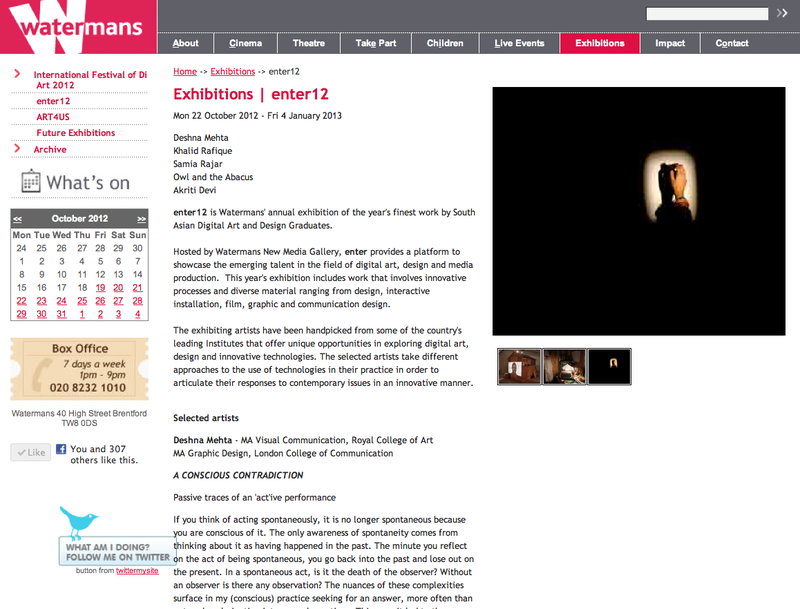 enter12 is Watermans’ annual exhibition of the year’s finest work by South Asian Digital Art and Design Graduates. Hosted by Watermans New Media Gallery, enter provides a platform to showcase the emerging talent in the field of digital art, design and media production. This year’s exhibition includes work that involves innovative processes and diverse material ranging from design, interactive installation, film, graphic and communication design. The exhibiting artists have been handpicked from some of the country’s leading Institutes that offer unique opportunities in exploring digital art, design and innovative technologies. The selected artists take different approaches to the use of technologies in their practice in order to articulate their responses to contemporary issues in an innovative manner. If you think of acting spontaneously, it is no longer spontaneous because you are conscious of it. The only awareness of spontaneity comes from thinking about it as having happened in the past. The minute you reflect on the act of being spontaneous, you go back into the past and lose out on the present. 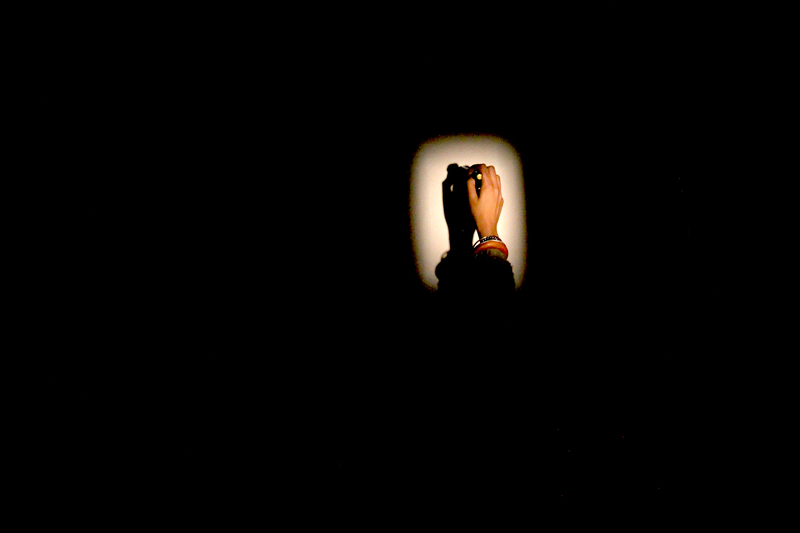 In a spontaneous act, is it the death of the observer? Without an observer is there any observation? The nuances of these complexities surface in my (conscious) practice seeking for an answer, more often than not, only culminating into several questions. This pursuit led to the exploration of quantum physics and eastern mysticism expressed metaphorically through a performative installation. What you will witness here is only a document, a re-enactment and a few traces extracted from the interaction with a performative installation which expresses that something’s cannot be documented or the act of documenting changes what ‘is’ being documented, therefore it ceases to be what it ‘is’. This installation is a ‘conscious’ attempt to ‘experientially’ bring forth the beauty and power of spontaneity(a moment that stems out of the sub-conscious/unconscious) embedded in the phenomenon of direct experience. For the very fact that it is a conscious attempt, it takes away from the act of ‘being’ or being spontaneous.